The LPSRO441 above has quite slow rolloff. Its only some 10 dB down at 22 kHz. Is this really enough? Energy that is present above 22,05 (1/2 Fs) will reflect back into the 0-22.05 range. So the resulting alias from your filter at 29 kHz will turn up as 29-22=7khz. At 29 kHz you are down only -15 dB. This is why "everyone" is aiming for -100 at 22,05 khz. During listening session yesterday over a pair of JBL Array 1500 and Hypex NC400 one can hear a noise trail around higher notes quite clearly. It creates a very "clear" sound but also it suffer from digitalis and really isn't clean. Are you sure you mimick the Ayre at 22,05 khz? Yes. The Ayre filter is -6dB at 22.05khz. -100db at 44.1khz. However, re-reading the WP this seems to be an older filter design which is superseded by the MP slow roll-off. The first approach to solving the problems of a conventional digital filter was to use a filter with less ringing, often known as a “slow roll-off” filter. This type of filter was used in the “Listen” position of the original Ayre disc players. By reducing the “sharpness” of the “knee” in the filter’s frequency response, the filter’s transient response is vastly improved. Now there is only about one cycle of pre- and post-ringing. 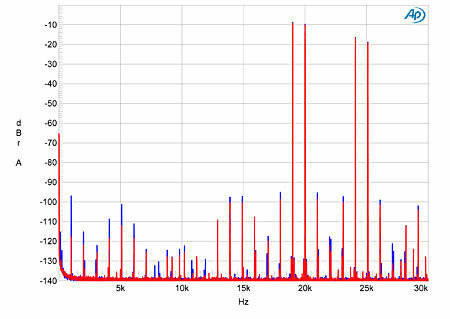 The penalty (remember, there is no such thing as a free lunch—only intelligent tradeoffs) is that there is more “leakage” (aliasing) of high frequencies above 22,050 Hz back in to the audio band. Still, this only affects very high frequencies and the levels are low enough not to cause audible problems. This “slow roll-off” filter reduces the time smear by a factor of ~20x compared to conventional digital filters. The net result is a much more musically natural sound, as the ear-brain is very sensitive to time-related distortions. This filter provides an outstanding compromise between frequency response and transient response, and for ten years was the mainstay of Ayre’s digital audio filters. Last edited by spzzzzkt; 15th February 2015 at 09:38 AM. Åhå. And this is all their filtering. There are no additional analogue ones? Does anyone have any idea wtf Mike Moffat of Schiit Audio is talking about wrt the bit-perfect audio filter in their upcoming DAC? Just wondering if anyone can work out the algorithm for the Soekris R2R and if it's as magical as they suggest. It is a digital filter/sample rate converter designed to convert all audio to 352.8 or 396KHz sample rates so that it may drive our DACs. You get it from us; it is our filter. It keeps all original samples; those samples contain rudimentary frequency and phase information which can be optimized not only in the time domain but in the frequency domain. We do precisely this in the Yggy with said filter; this is the reason that on good recordings through Yggy you can hear the hall, its dimensions, and the exact position of anyone coughing or farting in the room, the motions of guitars being hoisted in preparation of being played, sheet music pages being turned, etc. etc. This comes from our mega burrito filter. A friend of mine, Jonathan Horwich, sells analog master tapes in ½ track form – at least 15 IPS, and 30 (I believe) as well. On those analog masters, you can also hear the entire environment before the music starts – what is amazing there is that even if on accounts for hearing “down into” the analog noise, the S/N indicates a 14 bit performance at best for those tapes. 14 bit or not – those tapes, totally scratch my itch. If you want that, we got that and more in the Yggy. Some god marketing there. He claims that interpolation is a dead exact exercise - good luck with that. On close(r) recordings without deadening mastering you will hear people change page in then notes. Nothing special about that. Last edited by TNT; 15th February 2015 at 09:32 AM. The 29 kHz will turn up as 44-29=15kHz (first we are in the lower side band which is mirrored frequency wise). But still I also feel that the rolloff is too slow. It would be a strange design concept to combine slow digital filter with a fast analogue one. Ususally the arument is you can do the fast ones more precise digital. Last edited by zfe; 15th February 2015 at 09:47 AM. 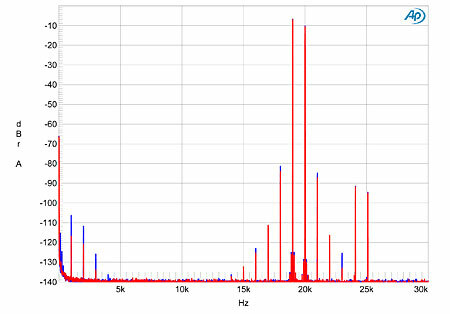 The difference is more alaising product but not at an alarming leve but look at the main IM product at 1khz. Now, today we don't build analogue circuits that produce -55 dB IM so I reckon this is a digital artifact coming out of alaising distorsion via the digital domain. These things make the sound appear clear but is tiring in the long end. I can find no description of the Ayre using additional analog filtering. I can't find Charles Hansen discussing anything but digital filtering, but they do use a discrete output stage so there may be something incorporated into that. Thanks Paul for creating these filters, those customizable filters makes the Soekris R2R much more versatile. When searching for information about filters I stumbled upon Auralic Vega DAC, it has different filters you can select. Most of the users prefer filter n°4 that is also a minimum phase. A friend of mine has created a few different filters. I will later present their characteristics. It would be interesting to hear what you think about them.